Arlington Heights, Ill., October 29, 2018 — If you’re interested in the latest evidence-based advances in clinical practice and the science underpinning implant dentistry while networking with dental colleagues across all specialties and corners of the globe, the Academy of Osseointegration’s (AO) 2019 Annual Meeting is a must-attend event. Registration is now open for “Current Factors in Clinical Excellence,” AO’s 34th Annual Meeting, recognized as the premier international multi-disciplinary dental meeting for professionals engaged in implant dentistry. 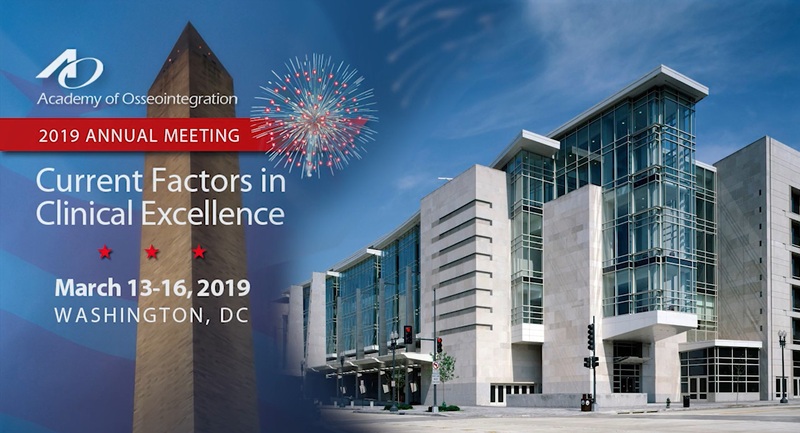 To be held March 13 – 16, 2019 at the Walter E. Washington Convention Center in downtown Washington, DC, AO’s 2019 Annual Meeting will include many exciting features worthy of attending this four-day, scientific Annual Meeting. United States Navy Captain Jonathan Forsberg, MD, PhD will kick off the Opening Symposium. His presentation “What Have We Learned in Orthopedic Osseointegration?” will feature the work of the DoD Osseointegration Program, and the correlations of osseointegration between the dental application and extremity surgery. Dr. Forsberg is an orthopedic oncologist and director of the DoD Osseointegration Program at Walter Reed National Military Medical Center in Bethesda, MD, and serves as assistant professor of surgery at Johns Hopkins University, where he provides surgical care at the Kimmel Cancer Center at Sibley Memorial Hospital. Reflective of AO’s fundamental multi-disciplinary composition, the Friday program will include day-long Surgical and Prosthetic tracks. All sessions will assemble the foremost authorities in evidence-based research and clinical practice who are on the cutting edge of scientific discovery in implant dentistry from around the world. In addition, there will be dedicated programs for Allied Staff and Laboratory Technicians. For an additional registration fee, scientific content of the Annual Meeting can also include a choice of six Hands-on Workshops and two pre-conference sessions, all of which will take place on Wednesday, March 13, 2019. New for 2019: The Academy’s popular limited-attendance and often sold-out hands-on workshops will be full-day sessions. Continuing AO’s tradition of supporting research and innovation, Oral Clinical and Oral Scientific Research and Clinical Innovations presentations will take place on Friday, March 15, 2018. With more than 250 abstracts and e-posters expected to be submitted for the 2019 Annual Meeting, attendees will be able to get a first-hand look at a wealth of original and groundbreaking research conducted by its international implant dentistry member community. Included in the research presentations will be 25 recipients of Student Travel Grants, made possible by the Osseointegration Foundation and Anker Dental Implant Systems. Now in its second year, this grant program awards $1,000 grants to the top 25 scoring student-submitted Oral Research and E-Poster abstracts for the 2019 AO Annual Meeting. On the social side, the 2019 President’s Reception will be held at the National Museum of Natural History. At this landmark AO event, registered attendees and guests will have the opportunity to view many permanent and special exhibits, exceptional objects, and one-of-a kind displays at the Museum, which boasts the largest natural history collection and is the most popular natural history museum in the world. In addition, the Washington, DC area offers numerous historical sites and other prominent attractions, making AO’s 2019 Annual Meeting a great opportunity for Annual Meeting registrants to also bring family members and extend their stay. • Most scientific sessions (including TEAM Program and laboratory technician programs). • More than 30 hours of ADA-CERP credit hours with prosthetic and surgical tracks. • A geographic focus on Europe with world renowned speakers from all continents. • Admission to the Corporate Forums and extensive exhibit hall. • Complimentary lunches in the exhibit hall. • Unlimited global networking with peers and students across all specialties.